This is Braelyn. Well, she used to be known as Braelyn anyway. 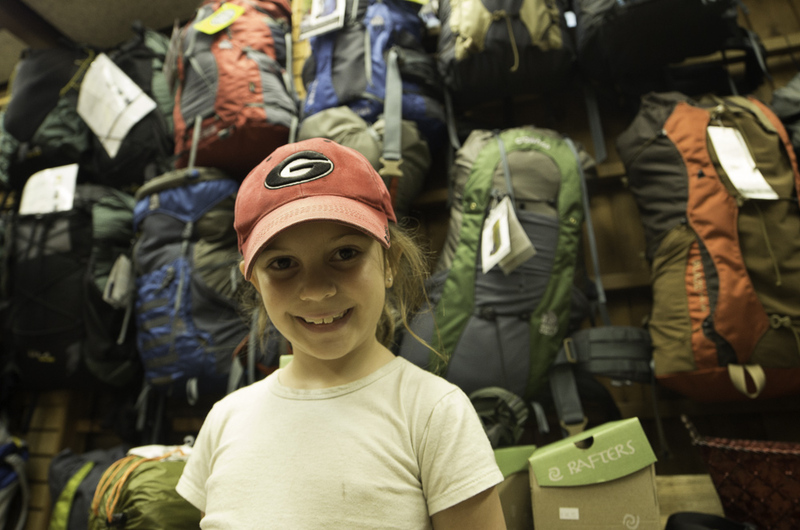 On her recent hike from Springer to Neel Gap (31 miles) her parents couldn’t figure out how it was that she simply never got tired, never slowed down, and was never daunted by the many ups and downs. They decided she must be hiding batteries somewhere, and that’s how they came up with her new name, Electric Bunny. “It’s because she just keeps going, and going,” said her dad. Here at Mountain Crossings it’s almost every day a group arrives who has just hiked that same section of trail. We get teenage boys, and even some adults, (with much longer legs mind you) who have more complaints than 7 year old Electric Bunny. And for the record she had zero complaints. 🙂 When she and her parents showed up and stayed at our hostel she was ready for a shower but otherwise all smiles. Some argue that the section of the AT that she hiked is 2nd in difficulty only to the exposed ridges of New Hampshire and, apparently, finishing her hike with absolute grace wasn’t enough for her. Upon staying at our hostel she decided she wanted to become it’s first ever official sponsor. Our hostel has undergone a major transformation in the last year and with new mattresses, insulation, better flooring and a serious deep clean it is a much nicer place than it has ever been. But that’s not to say that there isn’t room for improvement and Electric Bunny wants to help. When I asked her what it would mean to sponsor the hostel she said that she would like to mail us candy to keep in a bowl for when the hikers arrive (as well as some mints), and she wants to provide a few board games and VHS tapes that she thinks hikers would like out of their home collection. Electric Bunny is part of the American Heritage Girls, a faith based scouting group , and sending us goodies and games would probably satisfy the requirement for a service badge but she doesn’t stop there. She also wants to come up during our busy season in early spring to help feed the thru-hikers. She said, “I could even bring some of my artwork and we could put it up.” When asked for how long she wants to do this she just shrugged her shoulders. She’s in it for the long haul. We are honored to have Braelyn/Electric Bunny as our hostel sponsor. We are very much looking forward to seeing her and her family again when they come up to hike the section north of Mountain Crossings this fall. Thank you Braelyn, you’re awesome. Electric Bunny, Disco Rat (Dad), Moonshine (Mom), and her three sisters live outside of Greenville, SC. This entry was tagged appalachian Trail, Hostel, mountain crossings, Neel Gap. Bookmark the permalink. BEING THE GREAT GRANDPARENTS OF THE BUNNIE ,WE ARE NOT SURPRISED AT ANY THING SHE COMES UP WITH….HER MOM AND GRANDMOTHER DOES A GREAT JOB WITH ALL THE GIRLS …WE LOVE THEM ALL VERY MUCH…OUR BUNNIE IS ALSO AN AMAZING SCHOLAR WHO IS FAR AHEAD OF HER AGE GROUP…ALSO THIS WAS NOT HER FIRST HIKE,SHE HAS MANY MILES BEHIND HER… WE LOVE YOU BUNNY…….PAPA ROBERT AND GRAMMY ANN S.
What an adorable little girl! Loved reading about her! Love both her real name and her trail name!